Q. At a time when only three types of quarks were known, you predicted that there were six. Did you think you would be able to prove this one day? Also, what went through your mind when the sixth quark, known as top, was found in 1995? Only three types of quarks - up, down, and strange - were known when Prof. Maskawa and I published our paper in 1973. But in 1971, Prof. Kiyoshi Niu of Nagoya University and his cosmic ray group had discovered a new type of particle through experimentation. It generated a lot of discussion, as it was thought to be a new quark, the fourth quark, called charm. So we had a certain degree of certainty about the existence of the fourth quark. But the fifth and sixth quarks were just hypotheses. We simply suggested the possibilities, and our theory was received as a new line of inquiry. We never imagined at the time that our paper would help shape the Standard Model of the universe. But in 1974, the year following the publication of our paper, the forth quark, charm, was confirmed, and in 1975, the fifth lepton, tau, was discovered. These events were enough to convince researchers that these particles were not simply figments of our imagination, and that there were more undiscovered subatomic particles than they had thought. Our paper was subsequently received differently. Once the existence of the fifth quark, bottom, was confirmed, many researchers no longer doubted the existence of its partner quark - the sixth quark, top. When that was finally confirmed, everyone thought it was about time. So, in terms of the number of quark types, I think the discovery of the fifth quark in 1977 was more exciting and more significant than that of the sixth quark in 1995. Previously, some believed that quarks were not real particles but existed only in theory. But after the discovery of the fourth quark, the existence of quarks was generally accepted, and the fifth quark sealed the deal. The 1970s was a time of great development in the history of subatomic physics. Q. In 2001, you finally proved the CP violation theory using the accelerator at the High Energy Accelerator Research Organization (KEK). Could you tell us what you were thinking then? Six types of quarks were identified, but we still needed to validate our proposed CP violation mechanism. Doing so required experimentation, so we built the KEKB accelerator - an asymmetric electron-positron collider - which has a 3-km circumference and 1-km diameter. An accelerator is a device that propels electrically charged particles, such as electrons, to close to the speed of light so they contain high energy. The KEKB accelerator can produce an enormous amount of particles called “B mesons” and “anti-B mesons,” and we carefully observed how they decayed. 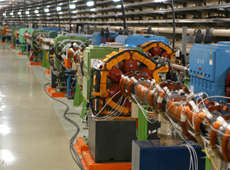 The accelerator is also known as a “B factory” as it produces B mesons. In 2001, with the KEKB accelerator and the Belle detector, we discovered that there was a slight difference between B mesons and anti-B mesons, which helped confirm the manifestation of CP violation. 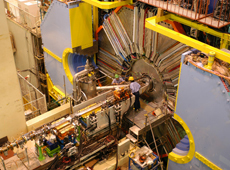 The Belle detector collects a billion B mesons produced in the B factory in one year and precisely measures their decay. I had been with the KEK long before construction of the B factory started, so it was very exciting to see the first results. I am a theorist so I wasn't directly involved in the accelerator experiments. Yet the report was a great relief, as I had planned the machine with the researchers and witnessed the years of their struggles. I think we were able to validate our theory thanks to Japan's world-class accelerator technology. Around the same time, our theory was also proved at Stanford Liner Accelerator Center in the United States using a similar accelerator. Q. What did the CP violation theory reveal about the origins of the universe? Our Standard Model can almost perfectly explain CP violation among subatomic particles manifested in an experiment facility such as a B factory. We also understand the principal mechanism of CP violation contributing to asymmetry between matter (particles) and antimatter (antiparticles) in the cosmos. Nevertheless, the Standard Model itself cannot yet explain the origins of the universe. The Standard Model is not enough to explain the dominance of matter over antimatter, which existed equally in the early stage of the universe. This indicates our incomplete understanding of subatomic particles. There are still unknown subatomic particles to be found whose interactions triggered other broken symmetry. It is essential to identify the particles involved and their characteristic behavior. Yet, even though the origins of the universe remain poorly understood, I think that our CP violation theory has helped establish the foundation for eventually resolving the question. Q. What fascinates you about the universe? I was not particularly interested in astronomy as a child, but I was really intrigued by the emergence of the new approach to cosmology with subatomic particles. Inspired by attempts to unveil the mysterious origins of the universe through subatomic physics, I wrote a paper on the properties of neutrinos as related to cosmology. Even today, I'm interested in cosmology from the perspective of subatomic physics.